Hundreds of boxelder bugs bask in the sun on the side of the boxelder bungalow. Previous episodes of Bug of the Week visited home invaders such as the brown marmorated stink bug, crickets, and multicolored Asian lady beetles. Recently, I had the golden opportunity to witness a remarkable infestation of boxelder bugs at a vacant home. An elderly farm house was transformed into a boxelder bungalow through a conspiracy of construction, landscape design, and, perhaps, weather. Like many rural homes, this one was constructed of wooden frame and clapboard. Drafty windows, screens in disrepair, and a poorly chinked stone foundation provided bugs with plenty of access to the interior of the home. Maples, boxelders, and ashes surrounding this house produced a fine crop of seeds to feed thousands of boxelder bugs. When I visited the property, thousands of boxelder bugs had amassed on the southern face of the house to bask in the sun. The answer to what generated this massive population of bugs was no mystery. The farmhouse was adorned by two massive ash trees in the front yard, a large silver maple by the side door, and dozens of boxelder trees in the hedgerows just a short distance away. All of these trees produce seeds used by the boxelder bugs as food. In addition to silver maple, boxelder, and ash, some favorite foods of these bugs include the sap and seeds of other species of maples, plum, cherry, and many other trees, shrubs, and vines. 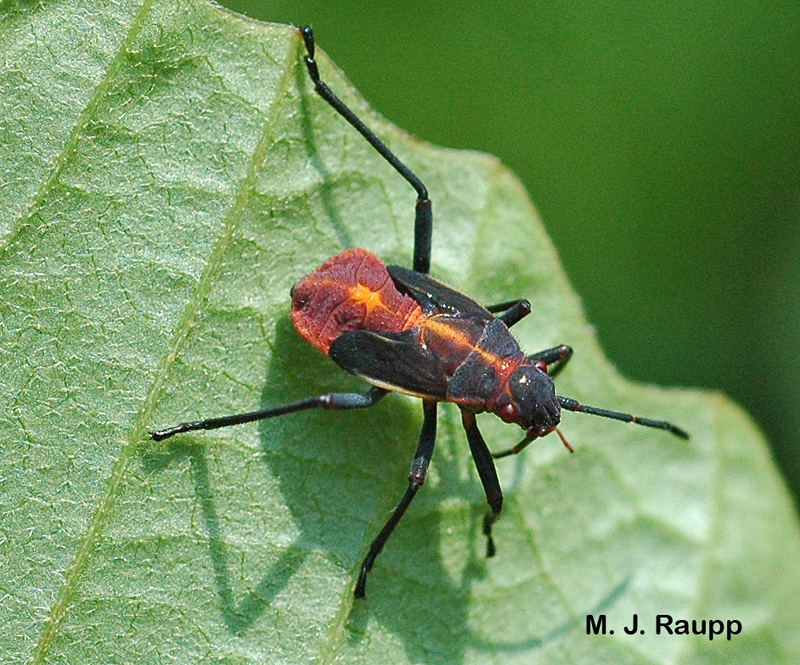 In spring, female boxelder bugs that survived the ravages of winter begin feeding and then lay eggs on the bark of trees, on leaves, or on the ground. Each female can lay 200 to 300 eggs during her lifetime. Eggs hatch in a few weeks and tiny wingless nymphs feed on plants during summer. Nymphs of boxelder bugs have black legs and short wing pads. Their exposed abdomen is red. As nymphs mature, their black wing pads grow longer and finally cover the abdomen as they molt to adulthood. 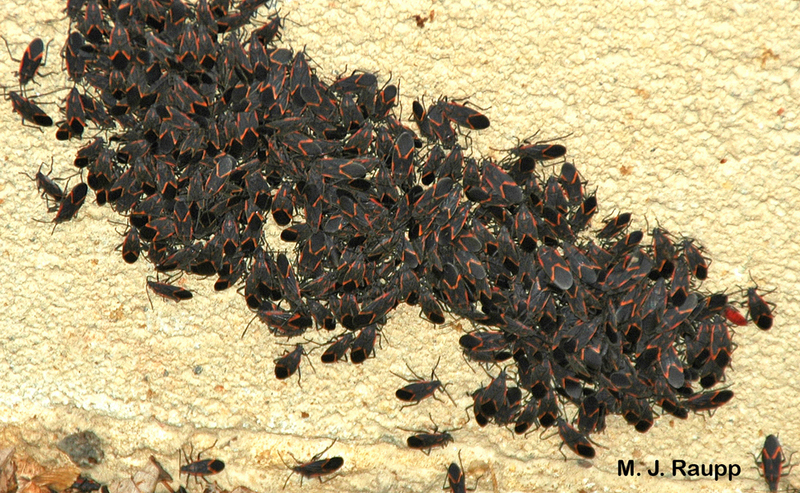 Depending on geographic location, boxelder bugs complete one to three generations each year. During late spring and early summer, they move to the boxelder and other seed-bearing trees. The largest populations of bugs accumulate on female trees that produce seeds consumed by the bugs. In autumn, swarms of bugs become a nuisance on sunny porches, siding, and around windows and doors as they seek overwintering locations. They find their way into our homes through cracks in the foundation, gaps in siding around windows and vents, and beneath doors if sweeps are in poor repair or missing. On cold winter days they are inactive, but when temperatures warm, they move about and make their presence known inside and out. Between meals the boxelder bug tucks its proboscis between its legs. Boxelder bugs are not harmful to humans or pets. They do not bite, sting, or reproduce indoors. However, if you squash them on your drapes or wall, they will stain. To limit the number of boxelder bugs taking up residence in your residence, eliminate overwintering places such as piles of lumber, rocks, and branches close to the house. Weatherproofing your home can also help bug-proof it. Caulk and seal vents and openings where electrical and plumbing utilities enter and exit the house. Repair or replace door sweeps and seal any openings around windows, doors, and foundation. For reasons known only to Mother Nature, this year was kind to boxelder bugs and they flourished. Maybe, trees produced exceptionally large crops of seeds or perhaps predators were busy killing stink bugs. Whatever the reason, boxelder bugs are making their presence known in the Baltimore-Washington area as they seek shelter in and around homes. Bug of the Week wishes you a delightful Thanksgiving and after you enjoy your feast, have a look for these interesting home invaders on a sunny afternoon in late November. Will these crafty invaders find a way inside before winter weather hits? We thank Ellery for finding the boxelder bungalow that served as an inspiration for this Bug of the Week. The wonderful reference “Urban Insects and Arachnids: A Handbook of Urban Entomology” by William Robinson was used as a reference.